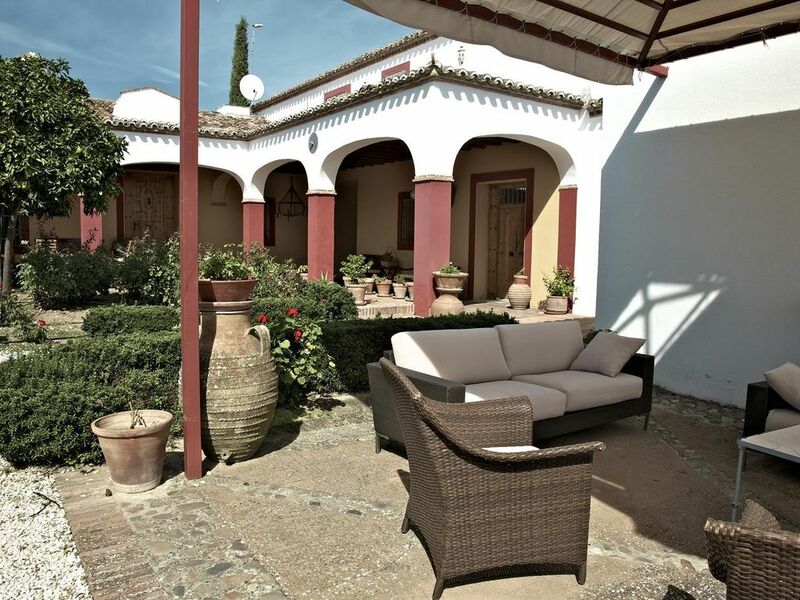 This Andalusian-style cortijo, set on a large private property of olive groves on rolling hills at an hour and a half from Madrid, is composed of 3 independent houses that can sleep 18 people. Casa Marrón on its ground floor has a large living-dining room with a woodstove, a dining table for 18, and an open kitchen, and a bedroom and bathroom. On the first floor are another 3 double bedrooms, 3 full bathrooms and a small sitting room. Casa Azul has a living-dining room with an open kitchen, 3 double bedrooms and 2 bathrooms, all on the ground floor. Casa Verde has its entrance at the top of a flight of stairs, and has a living-dining room with open kitchen, 2 double bedrooms and 2 full bathrooms. Around and between the houses are several picturesque patios, with garden furniture, a barbecue and a playground. On the edge of the cortijo confines, with impressive views of the olive groves and the different mountain chains on the horizon, are a 25 m. long swimming-pool with a separate children's pool, a basketball court and a soccer field. The area is ideal for long biking tours, and several bikes are available for our guests. Breakfast and other meals can be served upon request by the caretakers of the property. The cortijo is at 3 km. from the village of La Calzada de Oropesa, where basic supplies can be found. Larger shops, restaurants etc. can be found at nearby Oropesa de Toledo and Navalmoral de la Mata, just across the border with Extremadura. The surrounding landscape is very varried and attracts many bird species, with the endless Extremadura plains with olive groves and the typical holm oaks set against several mountain chains, from the Montes de Toledo and the Sierra de Guadalupe on the south to the Sierra de Gredos in the north. It is an ideal area for long biking or horseback riding tours. At about 5 km. is the beautiful lake Valdecañas in the Tage river, and the Isla de Valdecañas golf resort, with a beautiful 18 hole golf course and many other sports activities offered. The cortijo is also well situated for exploring the cultural wealth of the region, such as the monumental towns of Oropesa with its Parador-Castle, Trujillo with its conquistar palaces, the Guadalajara monastery, The city of Cáceres, declared World Heritage site by the UNESCO, and the Yuste Monastery, where Emperor Charles V spent his last years. There are also several areas of great nature interest, such as the Monfragüe National Park and the Sierra de Gredos. A spacious and charming property offering many family-oriented activities, in a stunning landscape and only an hour and a half from Madrid. Todo genial. Son varias casas dentro del mismo recinto. Quizás le falte un salón mas grande interior (nosotros éramos 20 con niños), pero en el patio exterior entrabamos bien. estuvimos pasando un fin de semana con 12 amigos. Nos alojamos en las casas marrón y verde. Son increíbles las dos, al igual que todo el cortijo con sus zonas comunes. El salón y comedor perfecto para el número de personas que éramos, las habitaciones amplias y muy cómodas las camas. Tanto Viveca, la persona que nos facilitó todos los trámites, como Alfonso, el guardés perfectos en sus atenciones. Sin duda recomendaría esta casa. Tanto es así que repetimos para fin de año!!!! We were 16 people and really enjoyed the stay. The place is amazing, completely lost in the countryside surronded by 1.000 olive tres. There were three separated houses so it is perfect for a large group looking also to keep some independence. The service was great and the owner very pleasant. As a venue for a family holiday, this place will take a lot of beating. It is located some way off the main road (2 miles) but its location is magnificent, with views over olive trees and an uninhabited plain stretching to the horizon. Our 2 houses were in excellent condition and were fully stocked with every household utensil. TV/video is also available. The facilities for children were second to none - good pool (with separate paddling area + plenty of pool toys), a halfsize football pitch, a netball court, roller skates, many bicycles, 2 tree houses. There are good walks to be had in every direction. The nearest town, Oropesa, is 5/6 miles away and has a good supermarket, one excellent restaurant and some others in the main square, a Parador (within the castle, which is open to the public) and 2 well stocked pharmacies. For those wishing to take a day out, there is the monastery at Guadeloupe and a beautiful church at Caceres, both about 60 miles away. No visit report of this place is complete without mention of the owner who lives part of the year in the main house. She could not have been more welcoming and helpful. She speaks excellent English and chooses just the right amount of time to be ' visible ' to us. Employed on the property is a Bolivian family who act as caretakers when the owner is away. They were invaluable, advising us on all our queries, repairing a shower that acted up temporarily, producing barbecues, ensuring the pool and surrounding areas were always clean, stocked with drinking water etc. This property has not only my wholehearted recommendation but that of all our 7 grandchildren. Getting there ? Some of us drove from UK (very straightforward), others flew to Madrid and hired a car. The journey from there is approx. 2 hours, travelling south-west. Estuvimos 18 personas en total entre padres y niños, alquilamos las 3 casas disponibles en la que se puede ver que están decoradas y distribuidas con lujo de detalles, camas cómodas, útiles de cocina para cualquier ocasión, hay mucho espacio en la finca para los niños y cada momento tiene un rincon en el cortijo para los adultos. Paraje natural preciso que invita a caminar, a jugar al football, al baloncesto, el guardes, Alfonso como Viveca hicieron que nuestra experiencia fuese maravillosa, tanto fue así que volveremos a repetir. Splendide maison au milieu des champs d'oliviers. Le calme garanti. Maison de trés grande qualité bien équipée et à 3km de autoroute ce qui permet la découverte de la région. Vous êtes très gentil! C'était un vrai plaisire vous recevoir dans notre maison. Merci pour tout et à bientôt!